Technological BI and analytics performance features must have a clear benefit in the business arena where it’s applied. 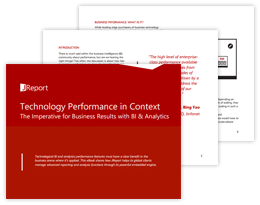 This eBook discusses how the speed of individual components of technology only matters as much as they directly help business. The first section discussed business performance as a whole, while the latter sections share how several global enterprises manage advanced, embedded reporting and analysis through a powerful embedded engine.